The Language of Stravinsky proposes new methods of looking at Stravinsky’s work, more than 40 years after his death. It considers both his individual compositions and the evolution of his work over his lifetime. The main purpose of the book is to analyse and clarify the inner coherence of Stravinsky’s music, despite the wide variety of styles, instrumental combinations and theatrical modes with which he worked. Though his career is often seen as falling into three distinct periods – Russian, Neoclassical and Serial – his work as a whole is threaded through with a language unique to himself as a composer. The analysis presented in this account identifies the basic elements and grammar of this underlying musical language. 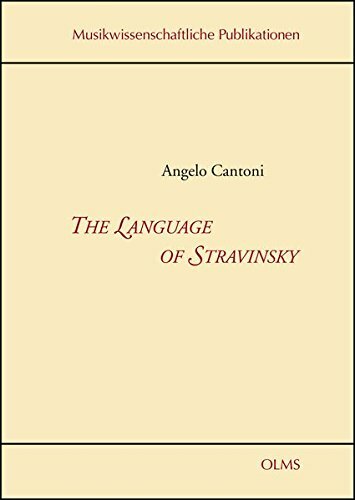 Each of the eight chapters of the book focuses on one aspect of Stravinsky’s musical language, followed chronologically within that chapter. The same works are therefore often studied in different chapters, looked at from a different musical perspective. This analysis of Stravinsky’s music over time provides major new insights into his work. View More In Musical Genres. If you have any questions about this product by Georg Olms Verlag, contact us by completing and submitting the form below. If you are looking for a specif part number, please include it with your message.